Art and design projects by John E. Scofield. With stories about the people, places and experiences that have shaped my work and life. 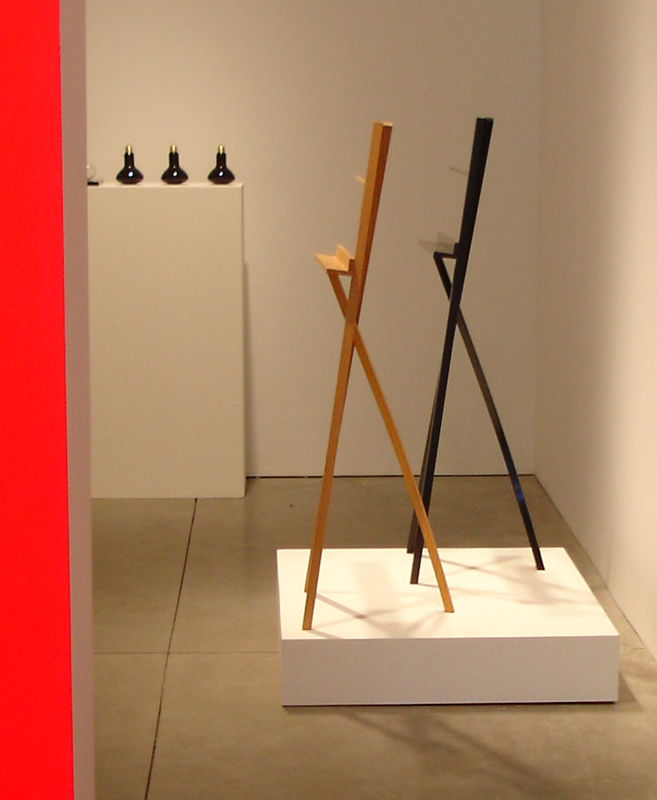 This show was organized by curators Juliet Kinchin and Luke Baker. The above photo was very generously provided by Chicago SOM architect Eric Keune. In the foreground is a scale model of the the 2008 Oslo Opera House. It was designed by the Norwegian firm Snohetta. used as an easel to display an art book. It's stability increases when a load is placed on the shelf. 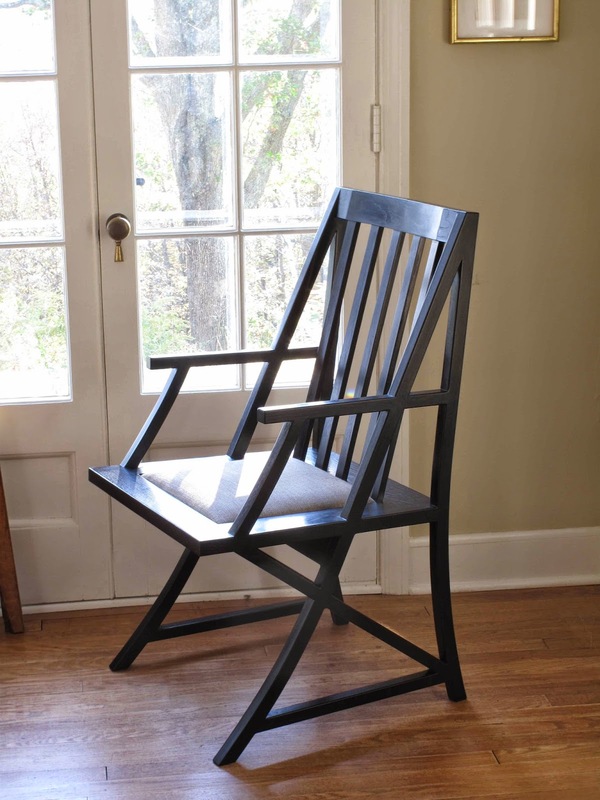 Shown in white oak with a black lacquer finish. The Folding Music Stand was designed in 1971 at the School for American Craftsmen, Rochester Institute of Technology. I was a twenty-one year old furniture design student. It was not a class assignment or even my idea to begin with. A fellow student in the metals department, Genie Goldberger, needed a music stand as a gift for a relative. Genie suggested a trade; that she would make me a chased silver belt buckle in exchange for a music stand. Her metals instructors were Hans Christensen and Albert Paley. The school had some remarkable people at the time. Hans had been goldsmith to the King of Denmark. Then, before coming to RIT, he was the senior designer at Georg Jensen. Franz Wildenhain, an original Bauhaus student in Germany, was head of ceramics. The following year I also traded for work in a similar way with Albert Paley when his studio was just a small room over a garage in Rochester, NY. 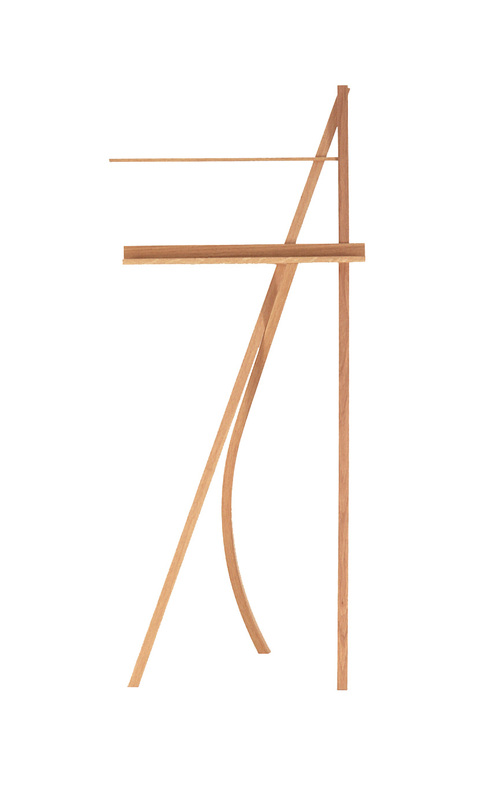 The Folding Music Stand design took exactly one week to configure as an experimental exercise in geometry and aesthetics. I’m a big believer in using full-scale mock-ups to move an idea beyond the drawing stage. Using various scrap materials, I focused solely on this design problem, and nothing else, every day and night for a week. It’s the kind of activity you can only pursue before marriage, mortgages and children; work exclusively on a problem that may not have a solution. The first two or three prototypes were total structural failures. They fell down! Curving one of the legs was the solution. In June of 1972 I left R.I.T. to work with Wendell Castle under a Louis Comfort Tiffany Foundation Apprenticeship Grant, one of two awarded that year in the USA. During the course of working for Castle I helped to build - or constructed alone - approximately one-hundred of his pieces. I also made a small edition, three or four, of his music stands. They were very sculptural, in the manner of organic vine tendrils, but significantly heavier in weight than my pared-down modernist design. Wendell was forty. I was twenty-two. 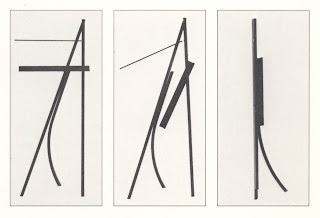 The Folding Music Stand design remained unknown for ten years while I built art galleries in Soho, installed sculpture at ‘Monumenta’ in Newport, RI, entered the Peace Corps in West Africa, worked full-time for Robert Motherwell (1975 to ’78) and pursued a career in sculpture. In 1982 I entered the stand in the 2nd Annual Progressive Architecture International Conceptual Furniture Competition.' I'll never forget hand-delivering my graphic-board entry to their Stamford, CT offices in the rain. The receptionist asked me to leave it in a storeroom down the hall. Hundreds of unopened packages were lined up on the floor of the room. One entry, from Germany, was wrapped with a handsome European-type of brown paper with a subtle, perhaps watermarked, zig-zag pattern. It was expertly glued tight with beautiful hospital corners and addressed in textbook calligraphy. Mine was hanging out of a dripping wet, black plastic garbage bag. No label. Prospects for my entry were obviously hopeless. Some months later Mr. Ambasz placed an order for two of the stands; one in natural oak and the other in black. This was my first order! He recently assured me that they are still on display in his apartment. 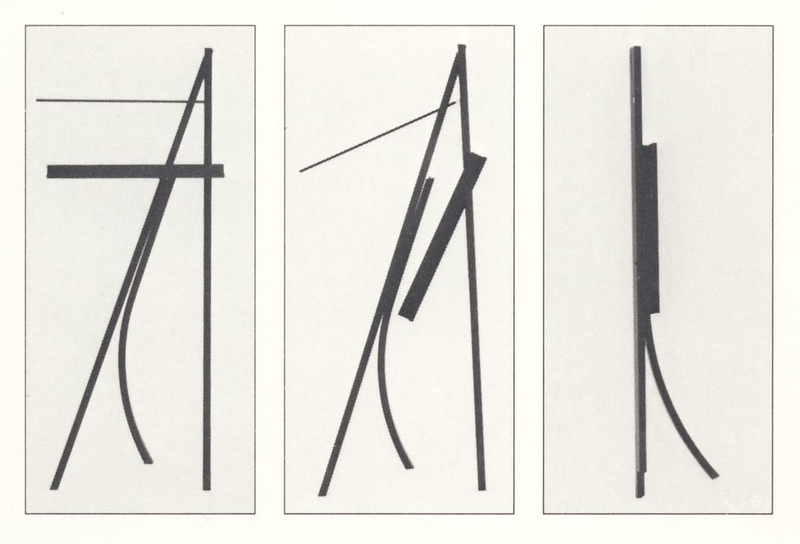 The Architecture and Design Committee at MoMA, in their 7 October 1986 meeting, agreed to include the Folding Music Stand in their Design Collection. It went on display within days and remained up until February of 1988 - about seventeen months. The director of the Architecture and Design department at that time was Stuart Wrede. Cara McCarty made the formal presentation to the committee. Philip Johnson personally voted for it. The donation of the stand to the permanent collection was made by the late Peter Stuart Scholl, a banker in Boston. Several editions of the stand were subsequently produced by my RIT classmate, Joe Tracy of Mt. Desert Is., Maine. Post script: The recollections below are perhaps tangential; what people nowadays call the 'back story' to the design. There is a small, circular metal part in the music shelf of the stand that locks it all together tightly. 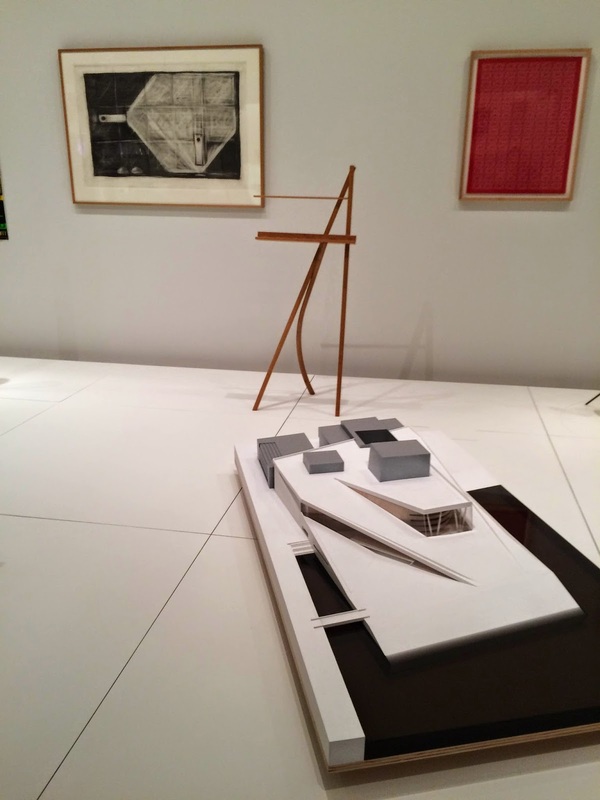 Without this part it is doubtful that the stand would have been accepted by MoMA's committee. Two Hungarian-born brothers owned G&B Machine in Port Chester, NY. They were my downstairs neighbors in our 38 Bulkley Avenue loft building. They made the first metal part prototype for me on credit. And they spent a lot of pro bono time helping me fine-tune the design prior to making it. Our mild steel prototype was produced on a metal lathe and a Bridgeport milling machine. It is the same part now installed in the stand owned by MoMA. One of the G&B Machine brothers had escaped from Hungary with his family in 1956. He was in his car waiting in line at the border crossing. His papers were forged. There was a family in their car ahead of him in line at the checkpoint. Their papers were not in order. The father in the front car panicked and hit the gas in a desperate bid to escape. The Hungarian border guards opened up on them with machine guns killing the parents - and also the children in the back seat. Within the space of a few seconds the whole family was dead. The machinist and his family were next in line. But the machinist did not panic. They were allowed through the border even though their papers were phony too. The guards were sympathetic with escaping families, but could not allow a broad daylight run-for-it. This is not from an Eric Ambler novel. It really happened. If these two brothers had not escaped Hungary and set up a business in America, the essential metal part for the music stand might never have been successfully developed. An additional technical note: Only the first prototype metal part was made out of mild steel by G&B Machine. All subsequent parts were made out of bead-blasted, 304 alloy stainless steel at Joe Tracy's brother's metal shop in Ann Arbor, MI. In 1966 The Harvard-trained architect Walter H. Kilham, Jr. taught me how to operate his table saw, band saw, jointer and planer. These wood working tools were in the basement shop of his home in CT. Upstairs in the library Walter had a lovely two-sided music stand in cherry made by Wharton Esherick. I looked at this hand-made music stand often; thinking it was the most beautiful thing I had ever seen. Walter worked for Raymond Hood during the depression when they built Rockefeller Center. In the '60s Walter's firm had two floors at 101 Park Ave., the 'architect's' building. They designed the National Library of Medicine, Bethesda; Robert Frost Library at Amherst; Harvey Firestone Library at Princeton; much of post-war West Point and many other projects. Walter was born in 1903. Died in 1996 in Kent, CT. He was a sort-of grandfather to my son, Jackson. One Saturday when we brought a decaff to-go and macaroon to Walter in his one-room apartment, Jackson and Walter ended up sitting on the bed together talking about the Civil War. Walter said, "There was a Northern General who said that a certain town on the Mississippi was 'too pretty to burn,' but I can't remember which town it was." Jackson, age 5, replied, "Oh, that was Natchez Walter." Astonished that such a little boy would know that, Walter said, "Well I'll be!" (Darned close but not exactly right. The actual answer was Port Gibson, Mississippi, also on the river just a few miles from Natchez). 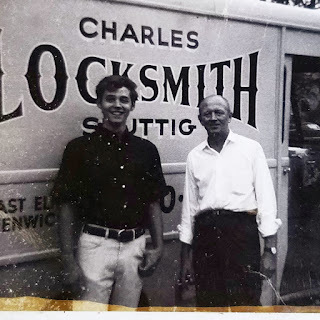 After school and on Saturdays starting in '66 I worked for locksmith Charles Stuttig. Charlie, a WWII vet, taught me how to pick locks; grind metal key-cutter parts by hand to tolerances of less than one thousandth of an inch and many other other useful skills. He had nicotine stains in his buzz-cut hair from parking cigarettes behind both ears while working. This was a habit acquired when he was repairing and rebuilding bombers 24/7 during the war. The planes were then sent back to Europe via South America and West Africa. He also held two United States patents for lock mechanisms. He was the youngest Sargent in the Air Force during WWII; lied about his age to get in. Walter Kilham and Charlie Stuttig taught me a lot. They saw an eager-to-learn teenager and they gave him a chance. I miss both of these men tremendously. Academics predicting your failure: In 1969 the head of the industrial design department at the Univ. of Bridgeport rejected my application. During the interview he said that I had, '...creatively peaked-out." The current MoMA show 'Making Music Modern' includes my Folding Music Stand of 1971. It is up through 17 Jan. 2016. The Folding Music Stand in white oak with a clear lacquer finish. 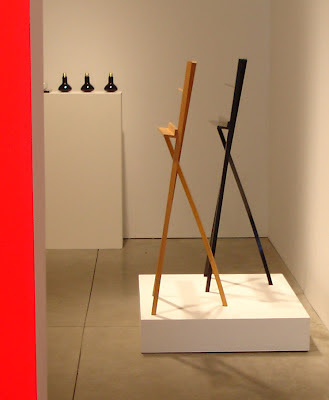 On display at the Max Lang Gallery, NYC, in 2007. This is the folding sequence. L-R: Fully assembled, partially folded, fully folded. Note that there are no loose parts. Music Stand companion dining / side chair in oak stained black. 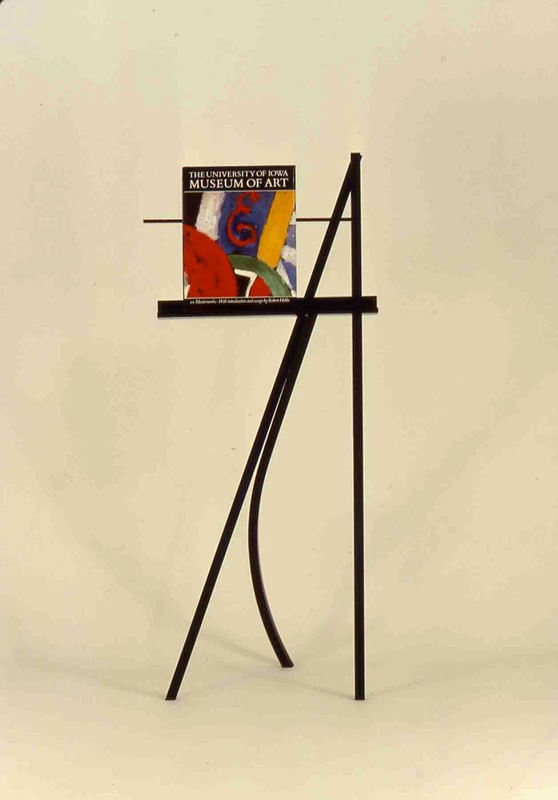 The Folding Music Stand / Easel and its companion Chair design shown in a broad pallet of colors. Museum of Contemporary Art, San Diego, CA. 1975-78 Studio assistant to Robert Motherwell. 1972-73 Apprentice to Wendell Castle under a Lewis Comfort Tiffany Foundation Grant. 1970-72 Rochester Institute of Technology, Rochester, NY, School for American Craftsmen. All content, text and photos, copyright John E. Scofield, 2013. Simple theme. Powered by Blogger.